Slotsholmen (English: The Castle Islet) is an island in the harbour of Copenhagen, Denmark, and part of Copenhagen Inner City. The name is taken from the successive castles and palaces located on the island since Bishop Absalon constructed the city's first castle on the island in 1167 at the site where Christiansborg Palace lies today. Recognised as the centre of the Government of Denmark since the Middle Ages, the island is sometimes referred to as 'the Island of Power', and is lined with central government institutions and ministries; the name Slotsholmen is thus also frequently used as a metonym for overall Danish governmental administration. The island is dominated by the vast Christiansborg Palace which houses the Danish Parliament, the Supreme Court of Denmark, the Prime Minister's Office and the State Rooms of the Queen. Also located on the island are the most important ministries, the Danish National Archives, the Royal Danish Library, several museums and the historic buildings of the Christian IV's Stock Exchange, the Chancellery and Christian IV's Brewhouse. The site used to consist of several small natural islands in the sound between the islands of Zealand and Amager. 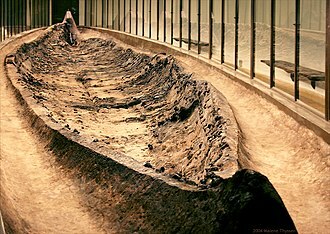 On the largest of these, Strandholmen (English: Beach Islet), Bishop Absalon of Roskilde constructed a small castle in 1167. In 1250 the castle was extended with two side towers to get the appearance that is now depicted on Copenhagen's Coat of Arms. The castle was conquered by the Hanseatic League 1368 and pulled down the following year as part of peace terms. Shortly after Copenhagen Castle was built on the same site and it became the residence for the Danish king in 1443. After the 1535-36 siege of Copenhagen during the Count's Feud, it became clear that the castle was outdated as a military installation, and King Christian III transformed the castle from a military stronghold to a more liveable royal residence. However, the reconstruction took place in a rather haphazard way and continued during the reign of the following kings, resulting in a rather irregular appearance of the castle. At the same time, it became clear that the castle was becoming too small to hold the functions necessary in order to function as a royal residence and seat of the administration so a series of smaller buildings began to be erected on Slotsholmen. Probably during the reign of Christian III a building was constructed on the quay of the canal in front of the castle to house the Chancellery. During the reign of Christian III and Frederick II an arsenal was constructed by the beach south of the castle, and during the reign of Frederick II probably also a supply depot. Under King Christian IV Slotsholmen saw considerable development, especially in the southern part of the island. Here a new naval harbour was established, surrounded on one side by an Arsenal and on the other side by a Supply Depot. Other new buildings constructed were the Stock Exchange and the Brewhouse. All four of these historic buildings are still there today. 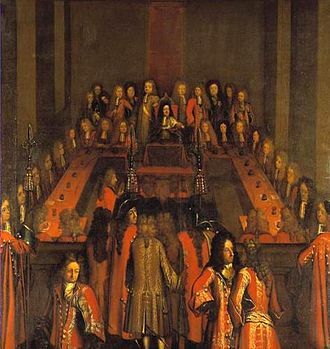 By the time of the introduction of the absolute monarchy in 1660, the role of Slotsholmen as the centre of administration was firmly established. During the reign of King Frederick III, further lack of space in the castle led to the construction in 1665-1673 of an additional building between the Supply Depot and the Arsenal. This building, also still visible today, was to house the Cabinet of curiosities of the king, founded about 1650, and the Royal Library, founded in 1648. During the reign of King Frederick IV, a magnificent administration building was constructed in 1716-21 next to the palace adjacent to the Supply Depot. This new building was to house the chancelleries, thus replacing the previous chancellery building situated by the canal. The new chancellery building was connected to the castle by an arched passageway, thus allowing the king to stay in close contact with his government. The Chancellery Building (also known as the Red Building or the Building of Colleges) has functioned as the heart of the central administration for almost 300 years, and is today used by the Ministry of Finance. In spite of many attempts and projects to replace the small and antiquated castle with a more up-to-date royal residence fit for an absolute king, the old castle continued to exist well into the 18th century. Several renovations were made, most notably by Frederick IV in 1721-29. This rebuilding thoroughly changed the irregular appearance of the castle to a more regular shape. 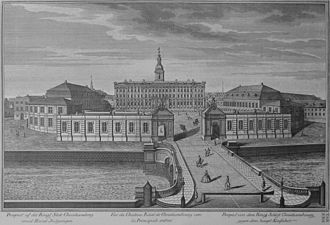 However, just two years after the rebuilding was completed, the Copenhagen Castle was demolished in 1731 to give room for three consecutive Christiansborg Palaces, the two first of which were destroyed by fires (in 1794 and 1884). Parts of the first and second Christianborg Palace still remain and is integrated in the present palace. 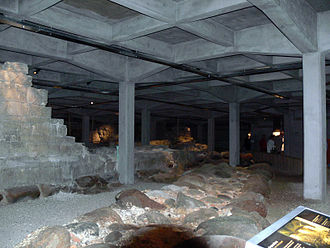 The ruins of Absalon's Castle and the Copenhagen Castle are excavated and at display today under the present Christiansborg. Slotsholmen is surrounded partly by Copenhagen Inner Harbour, partly by canals. Nine bridges connect Slotsholmen to the rest of Copenhagen, both Zealand-side and Amager-side. Knippelsbro is a bascule bridge and one of two bridges over Copenhagen's Inner Harbour, the other being Langebro. It connects Slotsholmen to Christianshavn by extending Børsgade to Torvegade. Marmorbroen (English: The Marble Bridge) connects Christiansborg Riding Ground Complex to Ny Vestergade that continues to Dantes Plads with the Ny Carlsberg Glyptotek. The bridge was constructed from 1739-45. It has a sandstone cladding with medallion ornamentation on the sides while to top is covered with marble. Stormbroen (English: The Assault Bridge) is a small arch bridge in stone, connecting Stormgade (towards The City Hall Square) with Vindebrogade on Slotsholmen. The bridge is named after the Assault on Copenhagen in 1659. It was at this very spot, where the city ramparts at that time was located, that the Swedish troops made their principal attack. After a series of defeats, the Danish troops finally gained victory, the Swedish troops leaving 2,000 dead soldiers in front of the ramparts at Stormgade. Various sources state that the bridge was erected in 1681 but on the side the inscription "erected in MDCLX is carved into its stone foundation. The bridge was renovated by Martin Nyrop in 1918. Højbro (English: High Bridge) is an arch bridge in wrought iron, connecting Højbro Square with Slotsholmen. It is designed by Vilhelm Dahlerup and was built in 1878. Holmens Bro and Børsbroen also used to be the work of Dahlerup but these gave both been replaced. The current bridge is not high at all. The name goes back to the wooden bascule bridge that was the first bridge to Slotsholmen. Holmens Bro is an arch bridge built in granite in 1954 to replace Dahlerup's design from 1878. Since efforts to improve water quality in Copenhagen Harbour has made the water clean enough to allow swimming, an open-water swimming competition around Slotsholmen has been revitalized. With the course being 2,000 metres, the 10,000 metre race involves five loops. There is both a competition for amateurs who swim in the afternoon and a FINA 10 km (6 mi) Marathon Swimming World Cup event with US$11,000 in prize money that takes place in the morning. The swim takes place in August and water temperatures are 18-22 °C. The nature of the course makes it unusually good for spectators and that combined with the historical surroundings have gained it a reputation as one of the best open water swim competitions in Europe. ^ Jytte Hilden: Slotsholmen, Magtens Ø. Copenhagen 2006. 202 p.
^ "Open Water, Round Christiansborg". Wonderful Copenhagen. Retrieved 2009-05-01. ^ "Open Water Swimming: World's Top 100 Open Water Swims". Open Water Swimming. Retrieved 2009-05-01. Cabinets of curiosities were encyclopedic collections of objects whose categorical boundaries were, in Renaissance Europe, yet to be defined. 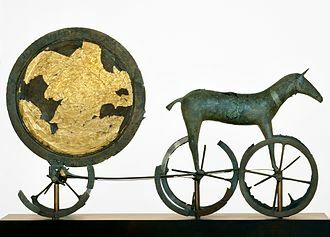 Modern terminology would categorize the objects included as belonging to natural history, ethnography, religious or historical relics, works of art, the Kunstkammer was regarded as a microcosm or theater of the world, and a memory theater. The Kunstkammer conveyed symbolically the patrons control of the world through its indoor, the term cabinet originally described a room rather than a piece of furniture. The classic cabinet of curiosities emerged in the century, although more rudimentary collections had existed earlier. The earliest pictorial record of a natural history cabinet is the engraving in Ferrante Imperatos DellHistoria Naturale, some of the volumes doubtless represent his herbarium. Every surface of the ceiling is occupied with preserved fishes, stuffed mammals and curious shells. Examples of corals stand on the bookcases, above them, stuffed birds stand against panels inlaid with square polished stone samples, doubtless marbles and jaspers or fitted with pigeonhole compartments for specimens. Below them, a range of cupboards contain specimen boxes and covered jars, two of the most famously described seventeenth-century cabinets were those of Ole Worm, known as Olaus Wormius, and Athanasius Kircher. Often they would contain a mix of fact and fiction, including apparently mythical creatures, Worms collection contained, for example, what he thought was a Scythian Lamb, a woolly fern thought to be a plant/sheep fabulous creature. However he was responsible for identifying the narwhals tusk as coming from a whale rather than a unicorn. The specimens displayed were often collected during exploring expeditions and trading voyages, Cabinets of curiosities would often serve scientific advancement when images of their contents were published. The catalog of Worms collection, published as the Museum Wormianum, used the collection of artifacts as a point for Worms speculations on philosophy, natural history. Cabinets of curiosities were limited to those who could afford to create, many monarchs, in particular, developed large collections. Frederick III was king of Denmark and Norway from 1648 until his death. He governed under the name Frederick II as diocesan administrator of the Prince-Bishopric of Verden, and he instituted absolute monarchy in Denmark-Norway in 1660, confirmed by law in 1665 as the first in Western historiography. He ordered the creation of the Throne Chair of Denmark and he was born the second-eldest son of Christian IV and Anne Catherine of Brandenburg. Frederick was only considered an heir to the throne after the death of his older brother Prince Christian in 1647, in order to be elected king after the death of his father, Frederick conceded significant influence to the nobility. As king, he fought two wars against Sweden and he was defeated in the Dano-Swedish War of 1657–1658, but attained great popularity when he weathered the 1659 Assault on Copenhagen and won the Dano-Swedish War of 1658–1660. Later that year, Frederick used his popularity to disband the elective monarchy in favour of absolute monarchy and he married Sophie Amalie of Brunswick-Lüneburg, with whom he fathered Christian V of Denmark. Frederick was born at Haderslev in Slesvig, the son of Christian IV, in his youth and early manhood, there was no prospect of his ascending the Danish throne, as his older brother Christian was elected heir apparent in 1608. Frederick was educated at Sorø Academy and studied in the Netherlands, as a young man, he demonstrated an interest in theology, natural sciences, and Scandinavian history. He was a reserved and enigmatic prince who seldom laughed, spoke little, and wrote less, even though he lacked the impulsive and jovial qualities of his father, Frederick possessed the compensating virtues of moderation and self-control. On 1 October 1643 Frederick wed Sophie Amalie of Brunswick-Lüneburg, the daughter of George, Duke of Brunswick-Lüneburg, who had an energetic, passionate and he was an enthusiastic collector of books and his collection became the foundation for the Copenhagen Royal Library. In his youth, Frederick became the instrument of his fathers political schemes in the Holy Roman Empire and he was granted administration of the Prince-Archbishopric of Bremen, the Prince-Bishopric of Verden, and named coadjutor of the Bishopric of Halberstadt. Christian IVs Arsenal, is a historic building on Slotsholmen in central Copenhagen, Denmark. It was built by Christian IV of Denmark in 1604 as part of a scheme for the construction of a new naval harbour. 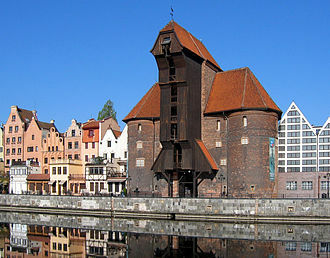 The arsenal, along several other buildings, surrounded the harbour basin which was connected to the main harbour by a narrow canal. Later, when ships too large to enter the harbour, the fleet moved to Bremerholm. Today Christian IVs Arsenal houses the Tøjhus Museum, a museum of weapons and military history, shortly after King Christian IV was crowned, he decided to re-arm. The rivalry with Sweden for control over the Baltic Sea called for a fleet with a well protected base. He therefore decided to build a new harbour at Slotsholmen next to Copenhagen Castle which used to be located where Christiansborg Palace stands today. There had been an arsenal on the site for half a century but it was a small, half-timbered building, one of several such arsenals spread across the city. In 1598, the king charged Bernt Petersen who had just completed the tower at Koldinghus. Six years a new arsenal was completed,163 metres long and 24 metres wide with walls three metres thick at the base. Next to it, Proviantgården, a depot was built with the same length and design. 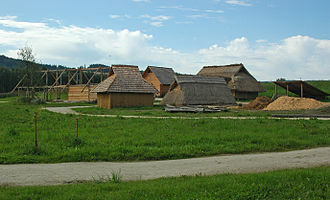 It was between two buildings that the new harbour was to be constructed. A local contractor, Melchior Spangenberg, was commissioned to dig out the harbour for a price of 1,800 thaler, a load of rye, a load of barley and a barrel of butter. The harbour basin was to have an area of more than one-half hectare, a canal,125 metres long and four metres deep, was to connect it to the coast. The entire complex was completed around 1610, ships could berth along either the arsenal or the supply depot and be loded and unloaded through gates facing the water. The complex had its own bakery and brewery today known as Christian IVs Brewhouse even though the building outdates him, when the brewhouse was completed, the brewer was provided with a large number of discarded mail sleeves for the scrubbing of brew kettles. Frederick IV was the king of Denmark and Norway from 1699 until his death. Frederick was the son of King Christian V of Denmark-Norway and his consort Charlotte Amalie of Hesse-Kassel, as crown prince, Frederick broadened his education by travelling in Europe, led by his chamberlain Ditlev Wibe. The one-story building, probably designed by Ernst Brandenburger, was completed in 1703, Frederick was allowed to choose his future wife from a number of Protestant royal daughters in northern Germany. In 1695, he visited the court of Gustav-Adolph in Güstrow, but his visit there was cut short by a message telling of his brother Christians serious illness. Frederick returned to Güstrow, where he was forced to choose the eldest of the unmarried princesses, on 5 December 1695 at Copenhagen Castle, he married Louise of Mecklenburg-Güstrow, herself a great-great-granddaughter of Frederick II of Denmark. 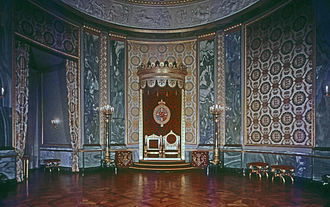 The couple were crowned King and Queen of Denmark-Norway on 25 August 1699 in the Frederiksborg Chapel, Fredericks most important domestic reform was the abolition in 1702 of the so-called vornedskab, a kind of serfdom which had fallen on the peasants of Zealand in the Late Middle Ages. His efforts were largely in vain because of the introduction of adscription in 1733, after the war and culture flowered. The first Danish theatre, Lille Grönnegade, was created and the great dramatist Ludvig Holberg began his career, also, a colonisation of Greenland was started by the missionary Hans Egede. 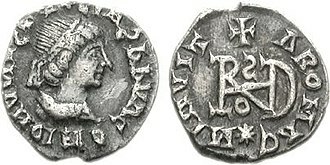 Politically this period was marked by the connection to the Reventlows, the Holsteiner relatives of his last queen. 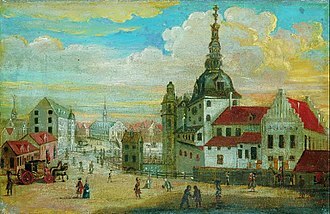 During Fredericks rule Copenhagen was struck by two disasters, the plague of 1711, and the fire of October 1728, which destroyed most of the medieval capital. 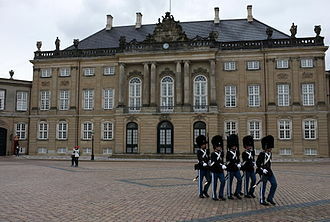 And Fredensborg Palace, both considered monuments to the conclusion of the Great Northern War and he maintained weekly audiences where anyone could attend and deliver letters with complaints or projects. While the nine weeks stay lasted, the king was a frequent guest on operas and comedies, during the visit to the state armory, he received the republics upscale gift, two large ore guns and an ore mortar. A regatta on the Grand Canal was held in his honour and is imortalized in a painting by Luca Carlevarijs. "Musei Wormiani Historia", the frontispiece from the Museum Wormianum depicting Ole Worm's cabinet of curiosities. A male Narwhal, whose tusk, as a Unicorn horn, was a common piece in cabinets. Crown-prince Frederick (IV), with his father in centre and his brothers Christian and Charles. Frederick as Crown-Prince by Hyacinthe Rigaud.